The ONOS Project, which is the open source SDN Network Operating System (ONOS) for service providers and mission-critical networks and hosted by the Linux Foundation, and the Open Networking Foundation (ONF) have collaborated to develop a leaf-spine fabric solution for data centers and service provider Central Offices. The effort has resulted in the first L2/L3 leaf-spine fabric on bare-metal switching hardware that is built with SDN principles and open source software. The fabric is built on Edgecore bare-metal hardware from the Open Compute Project (OCP) and switch software, including OCP’s Open Network Linux and Broadcom’s OpenFlow Data Plane Abstraction (OF-DPA) API. It leverages earlier work from ONF’s Atrium and SPRING-OPEN projects that implemented segment-routed networks using SDN. Verizon Enterprise Solutions announced its launch of Virtual Network Services with the aim of transitioning its enterprise customers to a virtual infrastructure model, providing greater agility and on-demand resources. The new services, which are underpinned by Verizon's open SDN and NFV architecture, will be available in the U.S. and internationally. 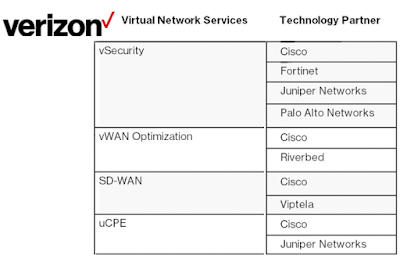 The virtualized services can be delivered across public, private and wireless networks from Verizon or other service providers, or a combination of multiple providers across multiple networks. The initial Virtual Network Service packages are: Security, WAN Optimization, and SD WAN services. Verizon said its goal is to enable clients "to essentially operate a “living” network that can be changed quickly to address the number of company locations and users, bandwidth required by application, and application use by employee to enable a secure, high performance and efficient network." Initial service release includes Cisco, Juniper Networks, Fortinet, Riverbed, Palo Alto Networks, and Viptela. 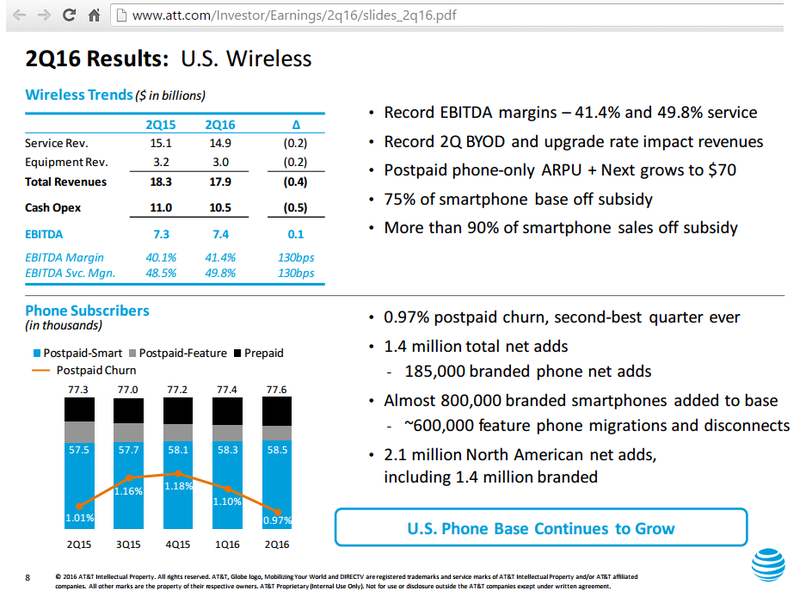 AT&T reported Q2 revenue of $40.5 billion, up more than 22% versus the year-earlier period largely due to the July 24, 2015 acquisition of DIRECTV. Compared with results for the second quarter of 2015, operating expenses were $34.0 billion versus $27.2 billion; operating income was $6.6 billion versus $5.8 billion; and operating income margin was 16.2% versus 17.5%. 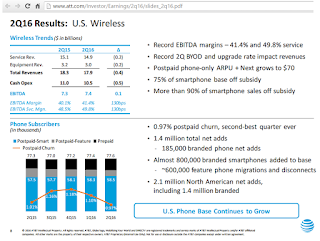 Second-quarter net income attributable to AT&T totaled $3.4 billion, or $0.55 per diluted share, compared to $3.1 billion, or $0.59 per diluted share, in the year-ago quarter. Adjusting for $0.17 of amortization, merger- and integration-related costs and other expenses, earnings per diluted share was $0.72 compared to an adjusted $0.70 in the year-ago quarter. “One year after our acquisition of DIRECTV, the success of the integration has exceeded our expectations,” said Randall Stephenson, AT&T chairman and CEO. “Cost synergies are ahead of target, we’ve added nearly 1 million DIRECTV subscribers since the acquisition, and our new video streaming services are scheduled to roll out later this year. We plan to serve every segment of the video industry and offer customers their favorite content virtually wherever and whenever they want it." Q2 revenues from business customers were $17.6 billion, down 0.5% versus the year-earlier quarter. Revenues from strategic business services, including VPNs, Ethernet, cloud, hosting, IP conferencing, voice over IP, dedicated internet, U-verse and security services, grew by more than $200 million, or 8.4%, versus the year-earlier quarter and 9.0% when adjusting for foreign exchange pressure. These services represent an annualized revenue stream of more than $11 billion. Is Microsoft on track to reach its stated goal of $20 billion in annual revenues from the cloud by FY2018? The big message from Microsoft's quarterly results issued this week is that the Microsoft cloud is winning significant customer support and is now on a $12 billion annual run rate. (Commercial cloud annualized revenue run rate is calculated by taking revenue in the final month of the quarter multiplied by twelve for Office 365 commercial, Azure, Dynamics Online, and other cloud properties.) This means Microsoft is catching up to Amazon and Azure could surpass AWS in revenue terms in the near future. Nadella's stated ambition is for Microsoft to achieve $20 billion in commercial cloud revenue in FY18 -- and he believes the company is on track to doing so. · The Intelligent Cloud segment delivered slightly more than $6.7 billion in revenue, growing 7% and 10% in constant currency. · Microsoft now has 33,000 customers for its Enterprise Mobility Solution -- roughly double the number over the past year. 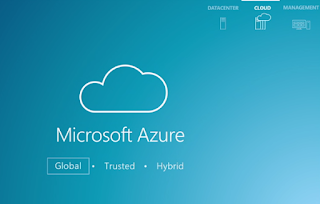 · Nearly one third of customer virtual machines on Azure are now running Linux. 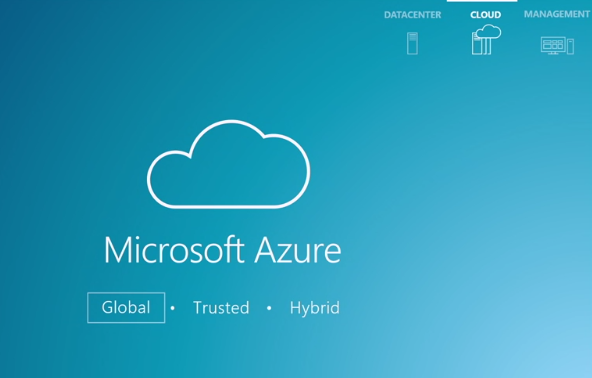 Microsoft states that one of Azure key advantages it spans multiple jurisdiction, covering more countries and regions with local support than any other cloud provider. This enables Azure to support regulatory requirements with the maturity and experience that are simply lacking in the other quickly growing clouds. For instance, Microsoft is the only big cloud provider that operates in China under Chinese law and in Germany under German law. The company is currently at 26 global data center regions and has announced plans for 34 data centers, but whether this number continues to expand depends on continued cloud growth and the development of regulatory issues. Regulatory trouble could hamper Microsoft’s top competitors, especially Google and Amazon. While Microsoft says that it is in-step with global regulators, recent news reports suggest that Google will be facing increased scrutiny from the EU. A report from CNBC this week stated the Google (Alphabet) could be subject to three separate anti-trust cases from the European Union, accusing the firm of using its dominant position in search, advertising, mapping and mobile OS to stifle competition. Charges have not yet been formally made, so the impact to Google financially and strategically is just speculation. Likewise, for Amazon, which has moved so aggressive in online commerce across so many markets, the question of which cloud continues to grow the fastest with the widest range of services, may be obscured by other activities underway at the parent companies. Recently, Cedexis, a San Francisco-based company providing Internet performance monitoring and optimization, released data company the end-user latency measurements for AWS, Azure, IBM Softlayer, Rackspace, and the Google Cloud Engine, as experienced from different regions across the continental United States. The data, which was collected in March and April of 2016, measured latency to specific cloud data centres. The Cedexis report shows that the Microsoft Azure facilities in general doing better than the pack, and in particular better than its closest market rival, AWS. The western US performed worse than other regions perhaps because of more congested peering points affecting all providers, according to Cedexis. Nevertheless, performance and security are becoming important differentiators as the big clouds move into real-time service for IoT devices. Microsoft has just scored a bit IoT with Boeing, which has just agreed to use the Azure IoT suite + Cortana for machine learning capabilities. On the partnership, Boeing will move its extensive digital toolset for its airline customers to the Azure cloud. The companies said this will “improve commercial aviation by enhancing factors like predictive aircraft maintenance, fuel optimization, airline systems and the overall cabin passenger experience.” Potentially, vast amounts of data from Boeing aircraft will be streamed into Azure data centers, where predictive algorithms will identify issues of concern to airlines and their passengers. Just a week earlier, Microsoft and GE announced a partnership that will make GE’s Predix platform for the Industrial Internet available on the Microsoft Azure cloud. GE of course a major supplier of aircraft engines, and has advertised heavily to promote its idea of embedding sensors into its industrial products. A year ago, GE first introduced its Predix Cloud -- a platform-as-a-service (PaaS) designed specifically for industrial data and analytics. This tie-up with Microsoft will provide Predix customers with scalable infrastructure, data sovereignty, hybrid capabilities, and advanced developer and data services. In addition, GE and Microsoft plan to integrate Predix with Azure IoT Suite and Cortana Intelligence Suite along with Microsoft business applications, such as Office 365, Dynamics 365 and Power BI, in order to connect industrial data with business processes and analytics. Microsoft has said that it is moving quickly to add intelligence and machine learning to the Office 365 product suite as well. If the company can bridge these same machine learning and Big Data analytics from Azure IoT to Office 365, then its relationship with the Fortune 1000 will become much more deeply embedded and increasing difficult for AWS to match given that Amazon lacks the Office suite to reach corporate works. As always, with big corporations there can be big distractions. In recent year, the Windows phone failure followed by the Nokia debacle proved quite costly to Microsoft. With Nadella in charge, the company has hopefully moved beyond these distractions. But the recent $26 billion bet to acquire LinkedIn acquisition may take some time to demonstrate how it delivers an equivalent business value to the company. Comcast will begin offering pay-as-you-go TV and Internet service. Xfinity Prepaid Services lets people sign-up for TV or Internet service and “refill” their subscription any time they would like for either seven or 30 days. The TV and Internet services, which come without a credit check or contract, will be available later this year starting in Illinois, Michigan, Georgia, Florida and Indiana and offered everywhere within the Comcast footprint by the end of 2017. 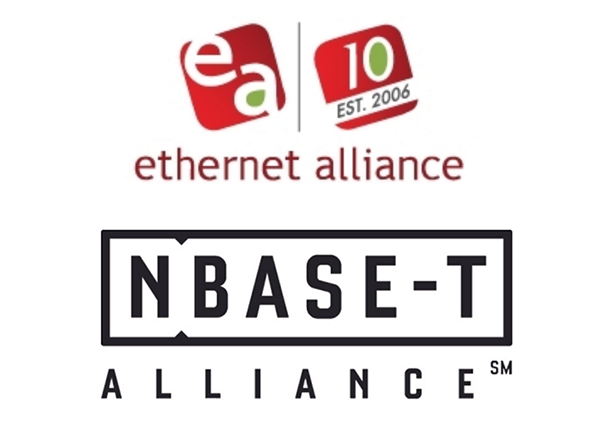 The Ethernet Alliance and the NBASE-T Alliance announced plans to validate multi-vendor interoperability of 2.5GBASE-T and 5GBASE-T Ethernet at a plugfest event scheduled for the week of October 10, 2016 at the University of New Hampshire InterOperability Laboratory (UNH-IOL) in Durham, NH. Both organizations will share post-event results of the interoperability testing performed, demonstrating the rapid maturation of 2.5GBASE-T and 5GBASE-T Ethernet technologies and their deployment readiness. The Ethernet Alliance and NBASE-T Alliance will continue to develop market awareness and education as 2.5GBASE-T and 5GBASE-T technologies are deployed on a global basis. IEEE P802.3bz defines 2.5GBASE-T and 5GBASE-T and offers a seamless upgrade to 1000BASE-T operation, which was introduced nearly 20 years ago. The new specification enables up to five times the speed with no changes in cabling infrastructure required, resulting in a better user experience. In addition, 2.5GbE and 5GbE are well suited to interconnect to the next generation of higher-speed wireless networks based on IEEE 802.11ac™. Salesforce has agreed to acquire Coolan, a start-up based in San Mateo, California, that develops code for optimizing servers in large data centers. Financial terms were not disclosed. Coolan, which was founded by brothers Amir and Yoni Michael, is described as a hardware analytics solution.